As Japanese right-wing groups accelerate their efforts to mobilize Japanese communities in the U.S. against what they perceive as “anti-Japan” historical awareness campaigns (especially on the topic of Japanese military “comfort women” system), Japanese-language free newspapers became a vehicle for their “educational” outreach. We have obtained recent copies of two such publications from New York, New York Biz and Weekly NY Seikatsu, both of which publish large opinion advertisements from far-right Japanese historical revisionist organizations including Nadeshiko Action, Global Alliance for Historical Truth, Himawari Japan, and New York Historical Issues Study Group as well as news articles detailing their activities. New York Biz, published by Weekly Business News Corp. began featuring a regular column by New York Historical Issues Study Group in September 2016. The first installment was a report about the Study Group’s most recent meeting in which Tsutomu Nishioka, Shiro Takahashi, and Tetsuhide Yamaoka gave lectures. Himawari Japan began publishing ads a year later, in September 2017. Himawari Japan and other groups including Nadeshiko Action frequently publish ads on New York Biz. 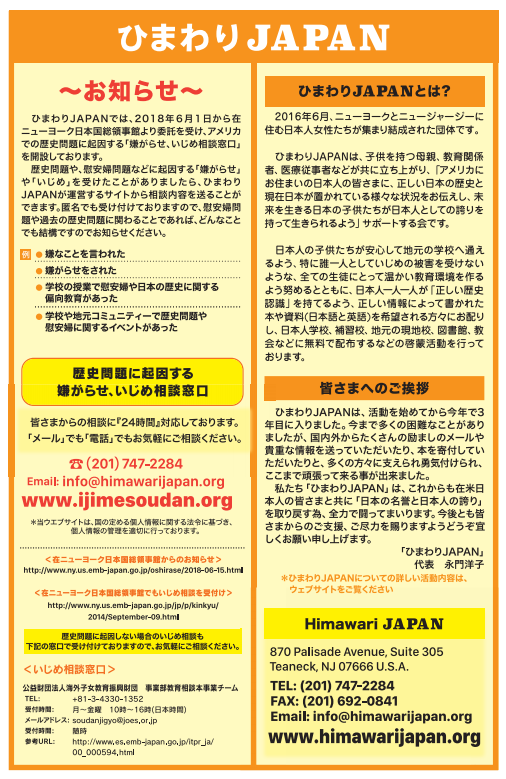 For example, the latest (September 22, 2018) issue contains a full-page ad from Himawari Japan seeking readers to submit information about anti-Japanese bullying motivated by “historical issues” as well as “anti-Japanese” education at schools and any community activities about the “comfort women” issue or other topics on Japan’s history. The same issue also publishes the number 26 of New York Historical Issues Study Group’s regular column and a midwifery ad by Yoko Nagato, the leader of Himawari Japan. 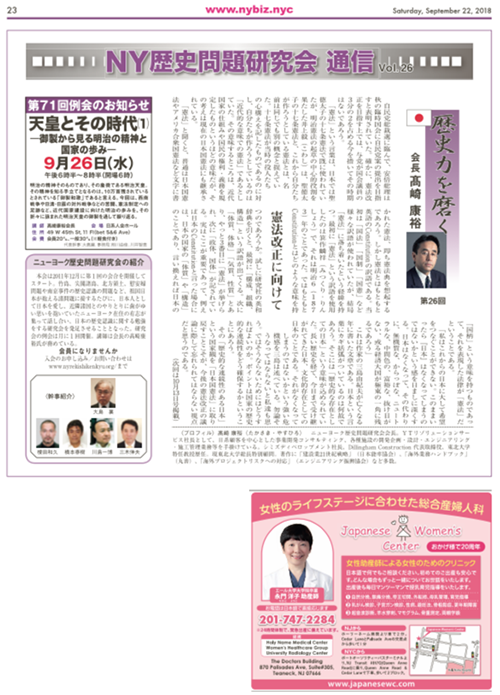 While New York Biz is an all-Japanese publication, Weekly NY Seikatsu devotes one page from each issue to English-language news and opinions, many of which are English translations of articles from Yomiuri Shimbun, Japan’s leading conservative daily. Global Alliance for Historical Truth, Nadeshiko Action, and other right-wing Japanese organizations publish ads on each issue of Weekly NY Seikatsu, alternating between Japanese-language ads and their English translations. Contents of these ads mostly consists of recycled right-wing talking points that have been thoroughly debunked years ago, but there are some new commentaries including Nadeshiko Action president Yumiko Yamamoto’s glorification of Confederacy leaders and monuments in Stone Mountain, Georgia. Weekly NY Seikatsu even has a section on its website dedicated to archiving these right-wing opinion ads. These advertisements threaten to blur the line between (highly dishonest) paid advertisements and news. For example, an opinion piece by the aforementioned self-identified “musical producer” Masaki Shirota was published as a Japanese commentary on the May 12, 2018 issue of Weekly NY Seikatsu, but when it was re-published in English in the June 16, 2018 issue it was labeled as “opinion advertisement.” The paper also regularly includes comments from members of Nadeshiko Action and Himawari Japan when reporting about anything related to the comfort women issue, even though the newspaper does not appear to be politically slanted to the hard right on any other subject. As newspapers continue to lose revenue due to the shift of advertising dollars to the internet, regular advertisements may give well-funded far-right groups disproportionate influence on the content of Japanese-language publications that many Japanese people in New York and in the rest of the U.S. rely on. Propaganda ads that falsely portray Japan as the victim of massive anti-Japanese historical campaigns by Chinese and Korean communities may even lead Japanese people living in ethnic enclaves to feel fearful of their Asian and Asian American neighbors and further isolate themselves from the American mainstream. We need to increase outreach to Japanese-speaking communities to break their isolation and share our experiences of allyship with larger Asian American communities to help them integrate more fully with the surrounding communities.